WarGreymon X is an altered version of WarGreymon that carries the X-Antibody Factor : WarGreymon in its Digicore. WarGreymon X was added to Korean Digimon Masters on August 22nd, 2018. 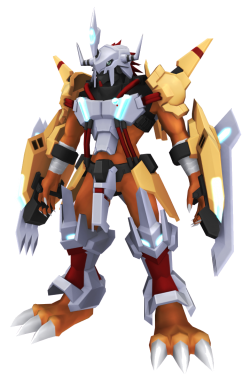 WarGreymon X was added to Global Digimon Masters with the September 11, 2018 Patch. Gaia Force Zero Fire attribute 3 seconds cooldown 128 DS consumed 2 skill points per upgrade Learned at Lv. Launches Gaia Force instantly and attacks zero distance. Poseidon Force Water attribute 10 seconds cooldown 400 DS consumed 2 skill points per upgrade Learned at Lv. Concentrates water with high pressure and shoot it at the opponent. Great Tornado Fire attribute 9 seconds cooldown 360 DS consumed 2 skill points per upgrade Learned at Lv. Stretches both arms forward, spin rapidly and charges into opponent. This page was last modified on 21 April 2019, at 22:35.